Great Britain’s Lions British have been were more experienced at international play in this game but the Mexicans were faster. 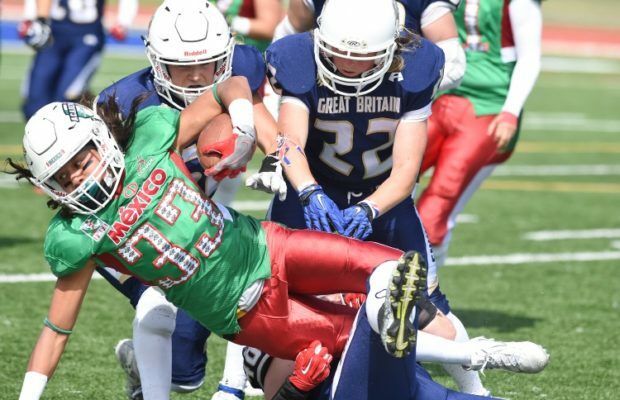 Speed often kills in football, and it did in this one, as Team Mexico downed the Lions 19-8 in the Women’s World Championship at McLeod Stadium in Langley, BC, Canada. The Mexican team was also tricky. Their first score was set up when Carla Fernanda Melo Hernandez threw backward to Arantza Jazmin Cisneros Estrada, who then threw across the field to Andrea Romero Vazquez for 19 yards to the British 4 yard line. From there, Pacheco Vazquez scored, and after Maria Fernanda Mandujano Abrejo kicked the PAT, the score was 7-0 Mexico. The British had chances, but broke down at key points. The Mexicans fumbled at their own 19, but the British 4th and 3 attempt from the 12 failed. Lucy Kirk intercepted Melo Hernandez on the Mexican 42, but the Mexican defense held. Mexico scored their second TD with 4:59 left in the half when Maria Fernanda Pacheco Garcia ran it in from the 7. The PAT was blocked, and Phoebe Schecter of the British team attempted to return it before she was ran down. Britain got into the end zone when RB Ruth Matta took the ball in from the 3 with 58 seconds left in the half. QB Jo Kilby scored the 2 point conversion after a bad snap, so the score was Mexico 13 Britain 8 at the half. The second half opened with a seesaw battle that ended with 1:54 left in the period. Cinthia Olivares Arredondo scored for Mexico on a pass from Melo Hernandez from 5 yards out. That ended the scoring with Mexico ahead by 19-8. Britain threatened twice more, but they were stopped each time on 4th down, getting as close as the Mexican 29 yard line. The Mexican speed was too much for the British, who might have experienced a letdown after avenging their 2015 loss against Finland in the first game. The players of the game were Andrea Romero Vazquez for the Mexicans and Ruth Matta for the British. Russ Crawford is an Associate Professor of History at Ohio Northern University in Ada, OH. The University of Nebraska Press published his book Le Football: The History of American Football in France in 2016. He is currently working on a project exploring the history of women's football.